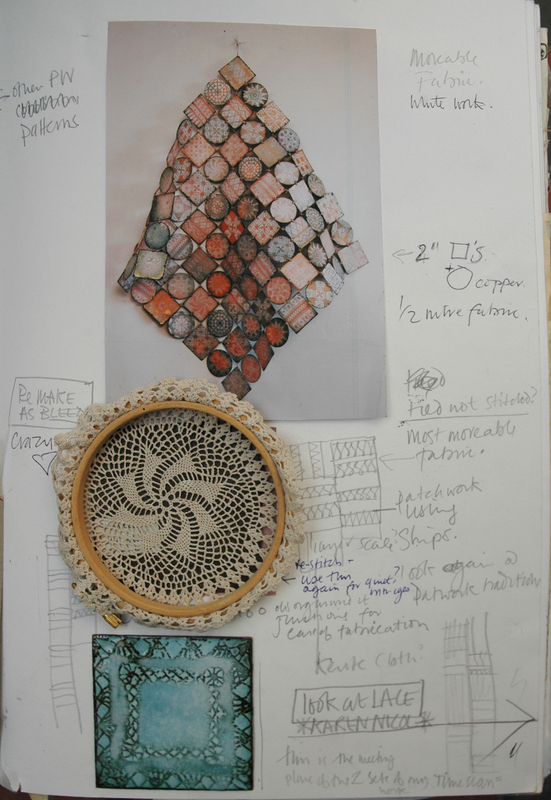 The fusion between the two main materials I use for my work, vitreous enamel and embroidery. 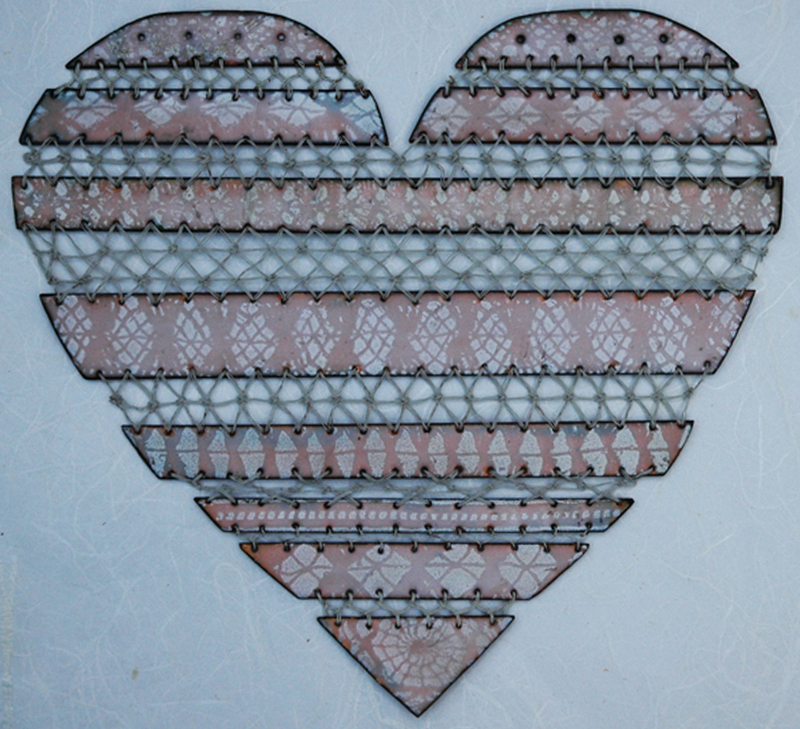 I have just made this broken and mended vitreous enamel heart for an exhibition, Heartfelt Bristol, which is being held between Friday 19th and Wednesday 24th November at the Centrespace Gallery, Leonard Lane, Bristol. 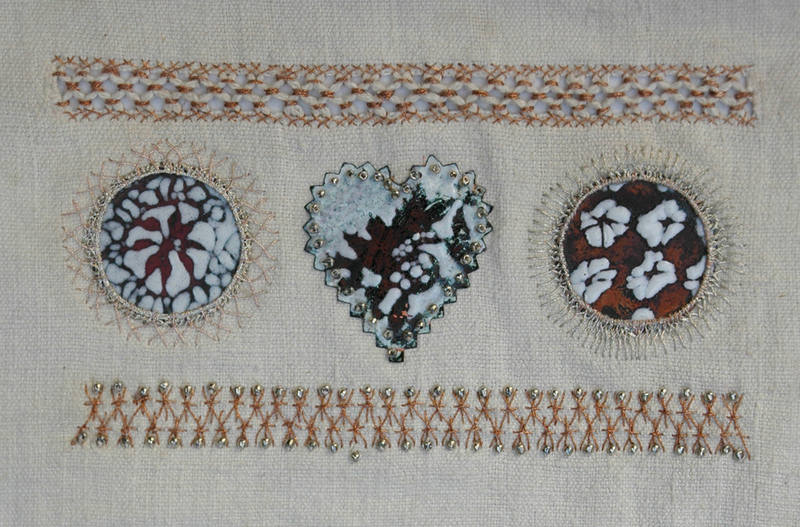 The Heartfelt exhibition has been co-ordinated by Bristol textile maker Jan Connett and she has been working on this project for the last 9 months. Each exhibitor has been asked to make a heart to commemorate their own heartfelt moment and complete it with a label that tells the story that inspired it – so far Jan has over 500 hearts complete with their messages. 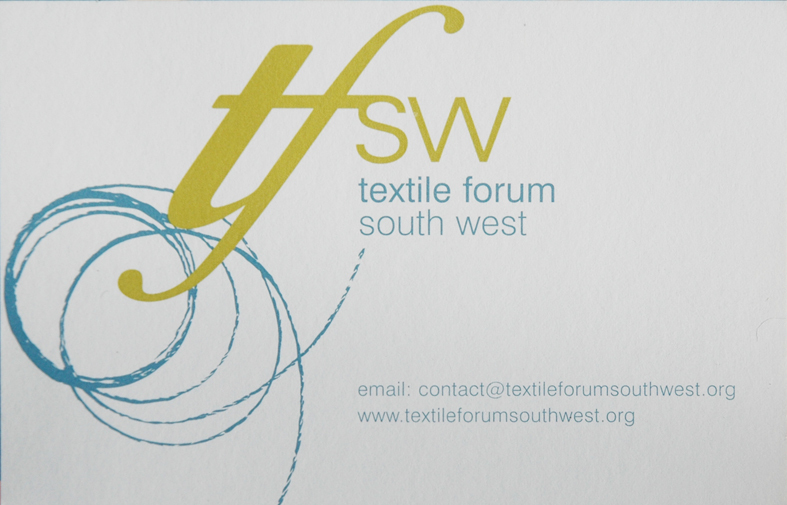 I have made this in the nick of time in response to a notice given at the last meeting of the steering committee of Textile Forum South West, which I chair. 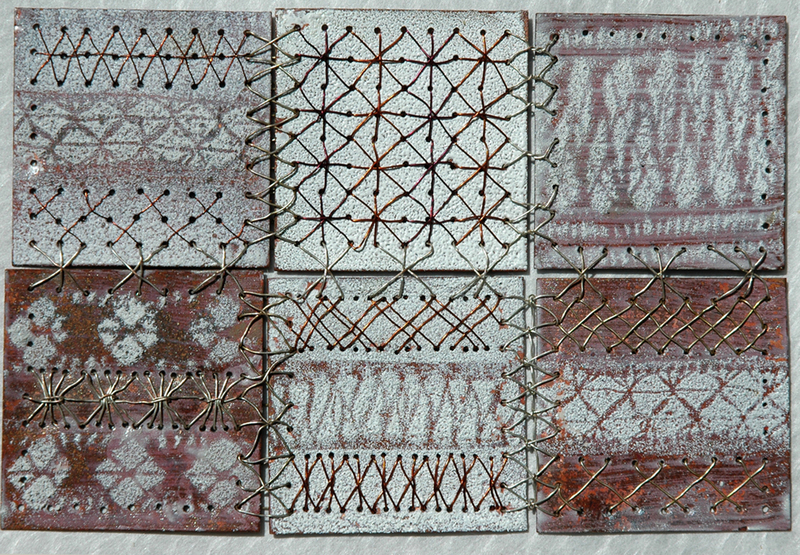 Jan is a member of TFSW and her work can be seen with many other members on the website. A group of us set up the Forum several years ago when some of the delegates and speakers at the Brunel Broderers‘ conference “No Man’s Land” sat down and talked together over lunch. We enjoyed meeting and speaking to fellow enthusiasts so much that we decided to continue to discuss and meet together in the future and try to include as many other textile practitioners, historians, lecturers and students as possible in the region. Sonja Andrew was the major driving force behind this move; she has since left the area to return to her native Yorkshire, but continues to keep in touch with us. At the quarterly meeting recently held at rooms at Bath Spa University, Corsham Court, I looked round the room where 8 of the regular steering committee members were discussing our next conference “Mapping the Future – Where are you now?” to be held in March next year. I thought how totally different we all are in our own practice, but we all pull together because we just love textiles..not matter what our discipline we can’t talk enough about the “stuff”. 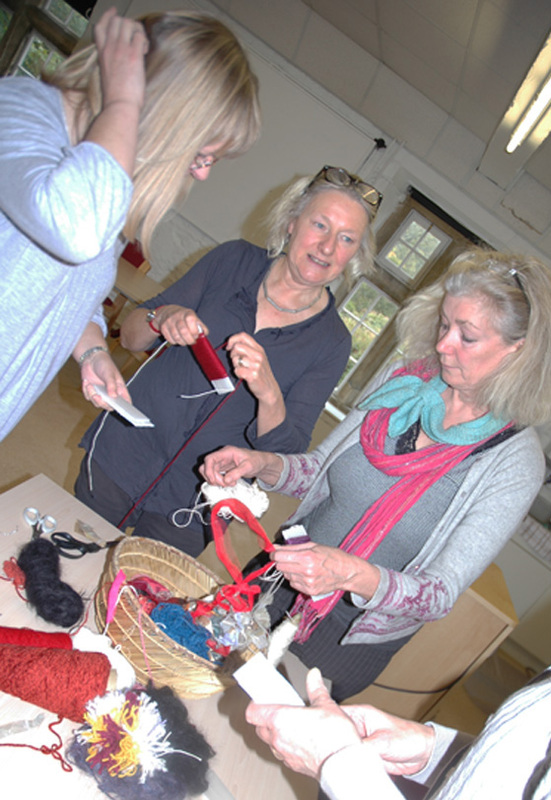 From the original group who formed TFSW there are 3 of us left and 2 of them were originally part of the Bunel Broderers group, Liz Harding who is currently studying for a PhD in at Bath Spa Uni and Brenda Miller who has recently completed an MA in Textiles at Goldsmiths University, London. Liz is at present the committee secretary and Brenda is heading up the exhibitions committee. 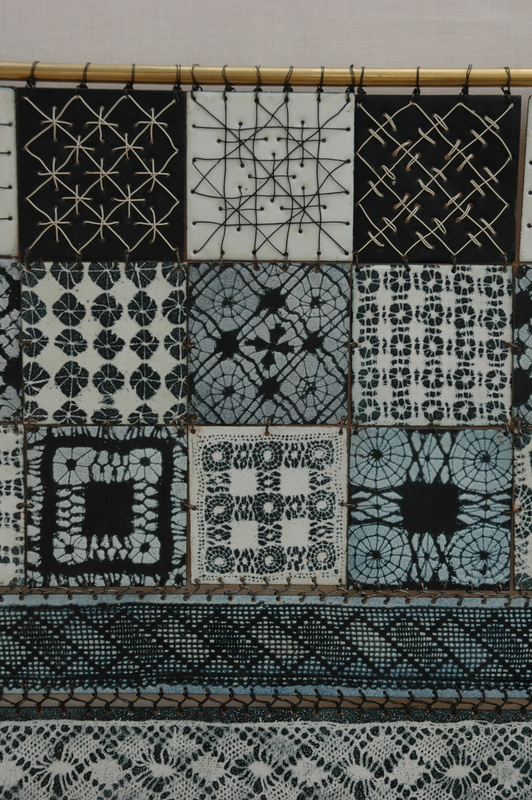 The next exhibition later this month at the Centre for Contemporary Arts and the Natural World, and is called Material Actions which TFSW developed with Plymouth University Arts. 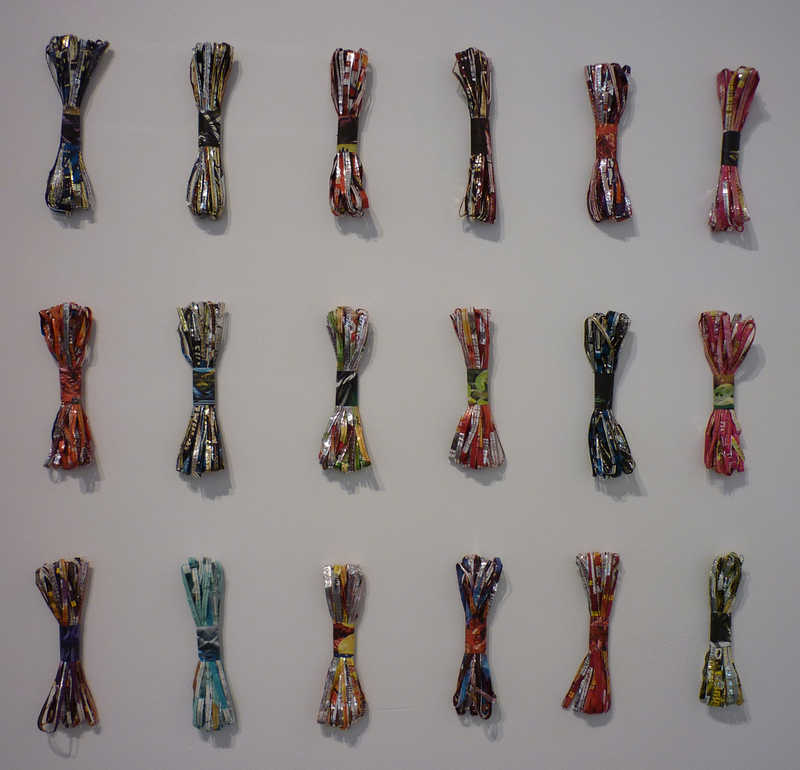 "Pass Me Another Crips Packet" skeins of prepared crisp packets ready for knitting - Alison Harper. 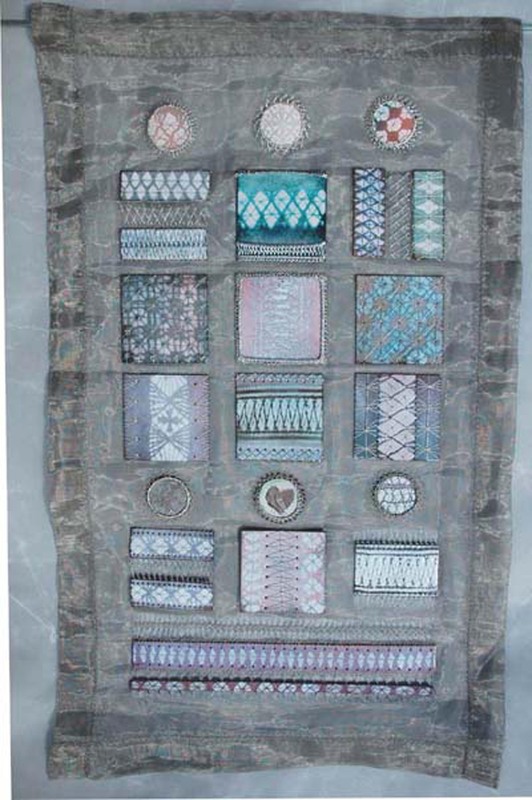 I have featured Kay’s work before in an earlier blog, she is looking at the whole idea of re-working patchwork – it’s getting very organic – I share with her the fascination of the written pattern papers still held in old English mosaic patchworks. 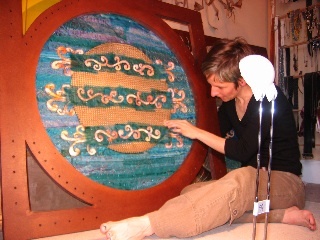 Jo Beal working in her studio. We are constantly looking for ways to sustain the activities of the forum and recently had a grant from the South West branch of the Arts Council – ACESW – where we have been assessing the audience and/or members’ requirements to grow and develop the Forum. Jo Beal is the person in charge of the bidding for grants and she oversees all our applications, we were having to give an account of the money in a written report and this meeting dealt with it. 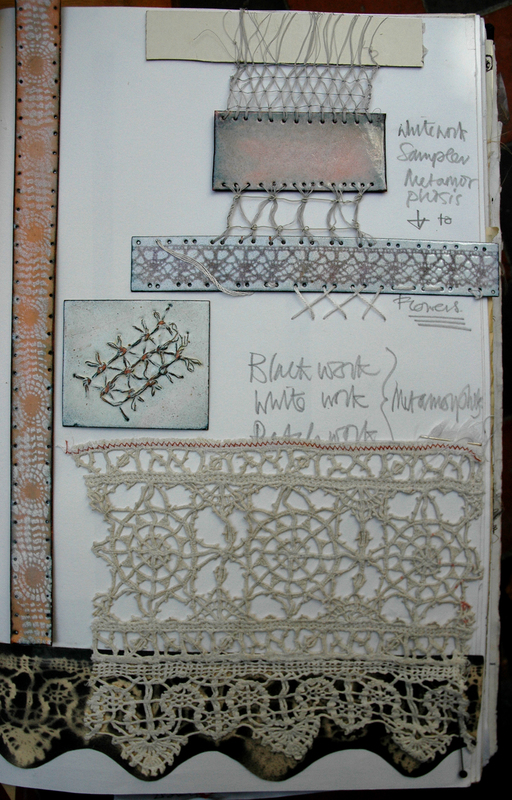 However her own work is varied, she stitches but she also draws and has her own pages on Flickr. 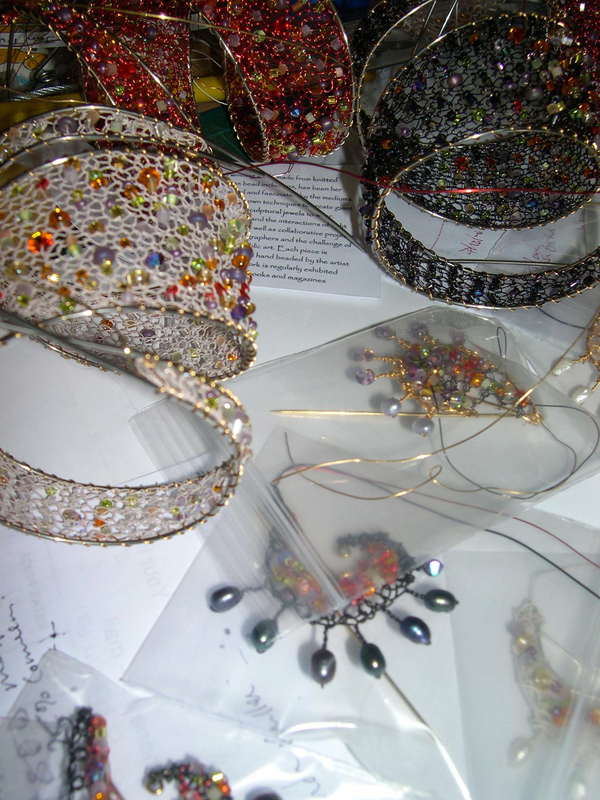 This just leaves me with 2 other members of the committee at the meeting, Jan Truman who works in beaded metal wire, I think she would term herself a knitter – but not as we know it. The image below is ” just one of several projects on the go at the moment. This is part of my 2010 jewellery collection for the Barbican. I exhibit there, with the Designer Jewellers Group each year, so make a special pearl range for the show. 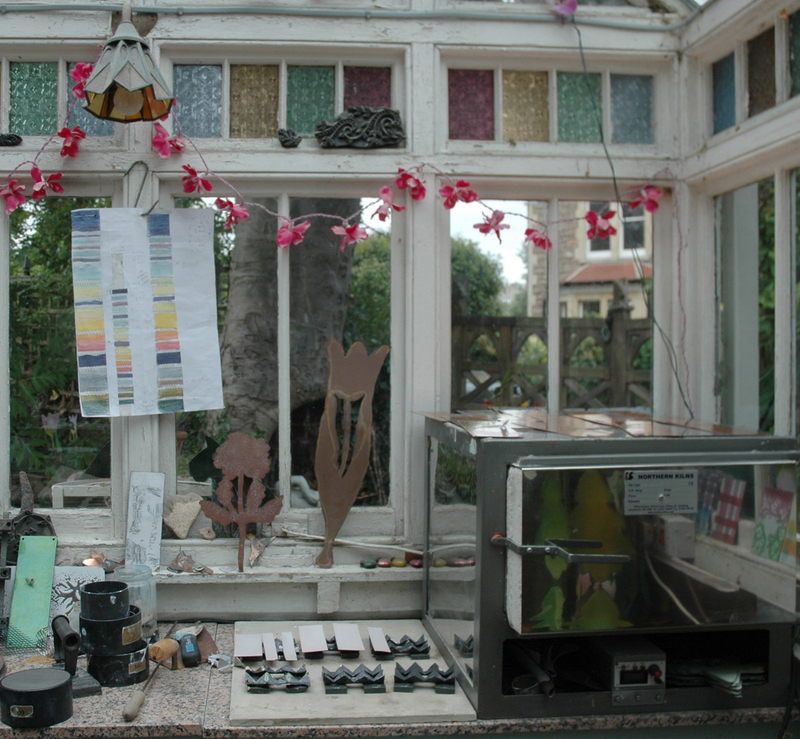 Our exhibition this year runs from 11th Nov 2010 to 5th Jan 2011″. And then last but not least – Liz Hewitt who does a whole lot of different things for the Forum. 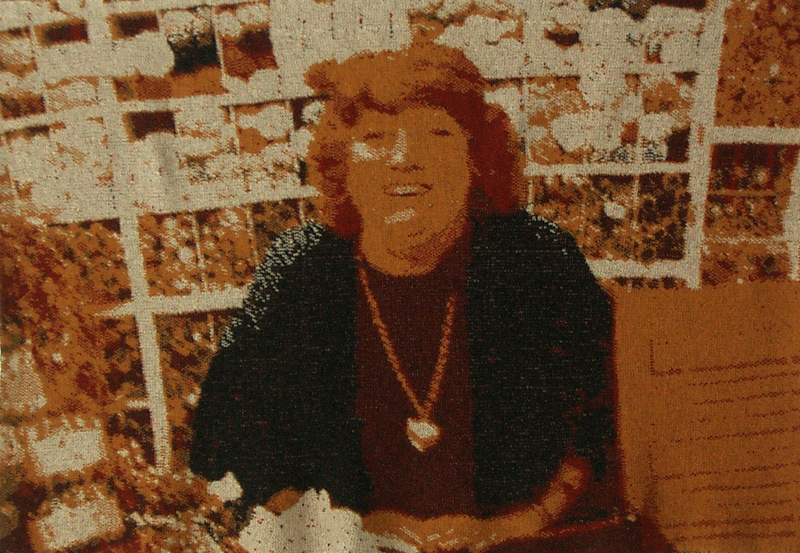 Her title is membership secretary but she also keeps us all up to date by sending out masses of news clippings and opportunities available between the bi- monthly newsletters posted by the Forum – a round up of everything going on in the textile world – it is worth being a member of the Forum just for these services alone. 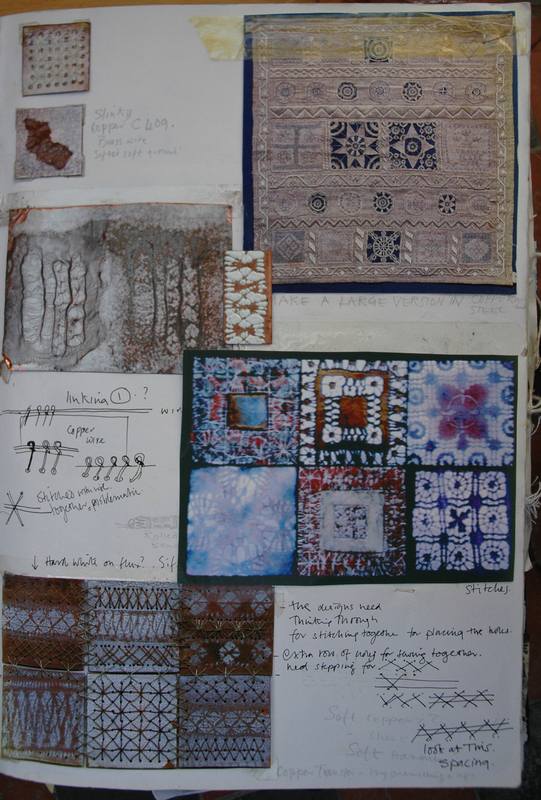 Also at present Liz is co-ordinating our next conference, as well as showing her dyed and stitched work in many exhibitions, throughout the country. 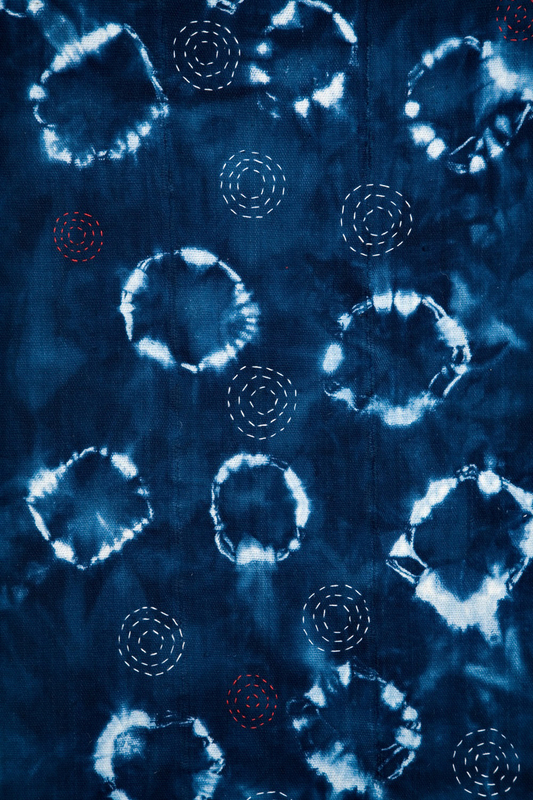 Hand dyed and stitched cotton cloth - Liz Hewitt. 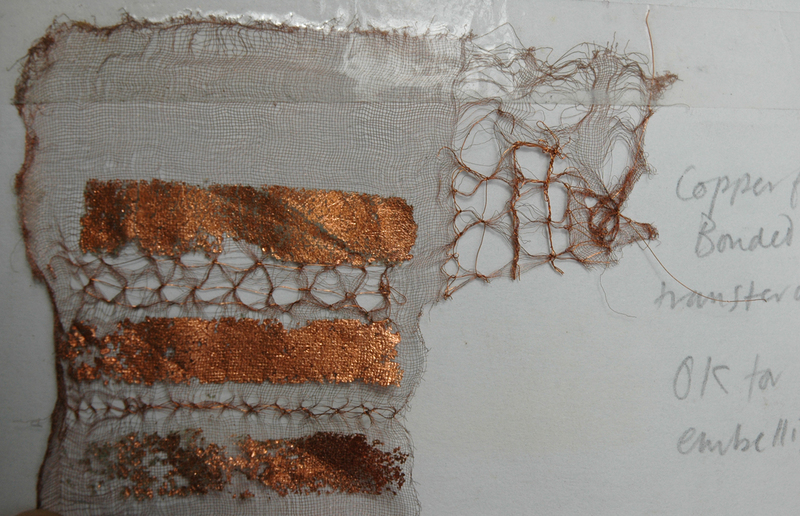 And Liz and I are meeting together at my studio later this week to talk about the possibility of running workshops in stitching and drawing in the Bristol area, so watch this space…. 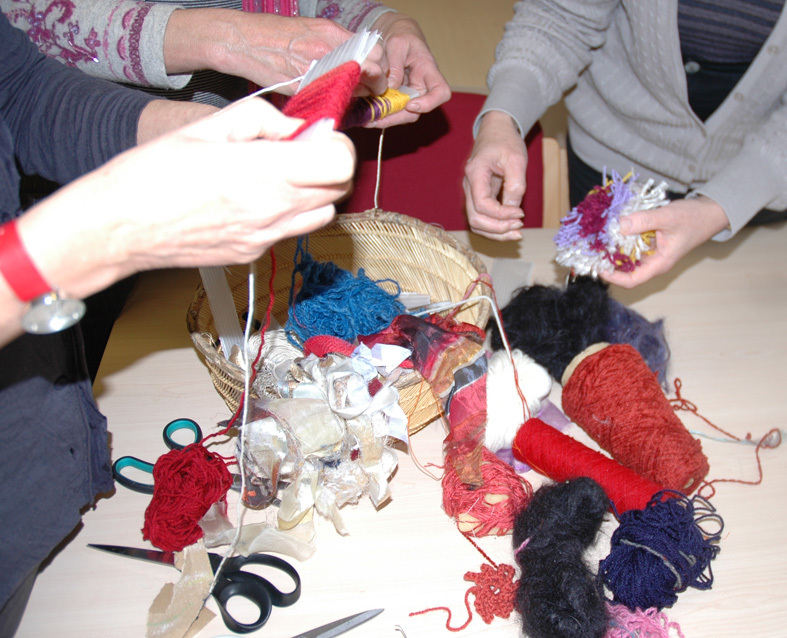 But I am leaving you pictures of the sampling session in the lunch break, where we tried out an idea of Alison’s to make pom poms as an idea for a workshop at the Mapping conference – the Yarnpomming project. If you are interested in joining TFSW – out of area members welcome as well please go to the website and check in with us. 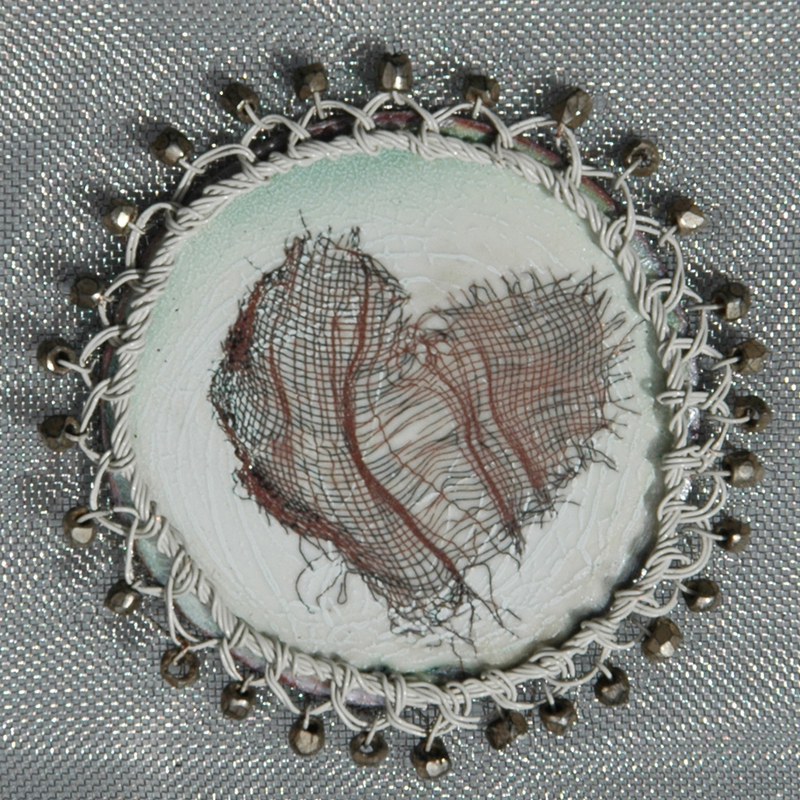 up close engaging with the "stuff"
Categories: Hearts, Stitched Enamel | Permalink. 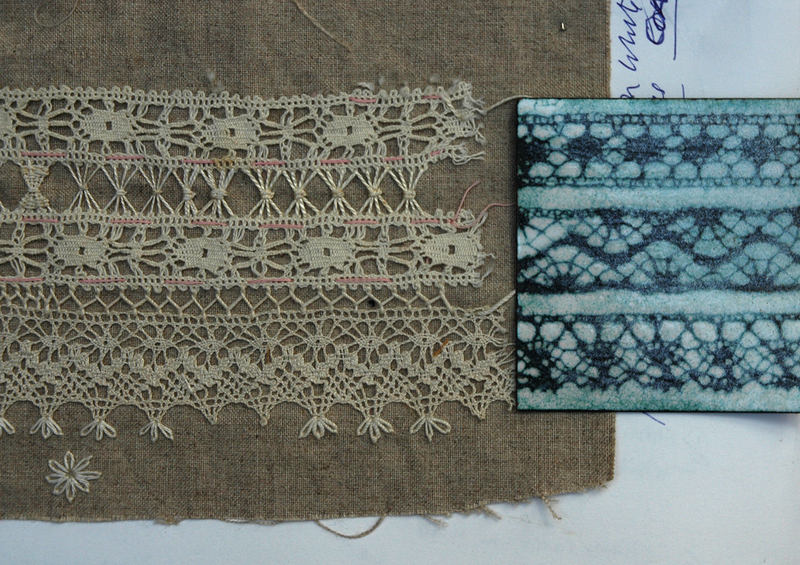 One week on and I have finally finished stitching the sky samplers. 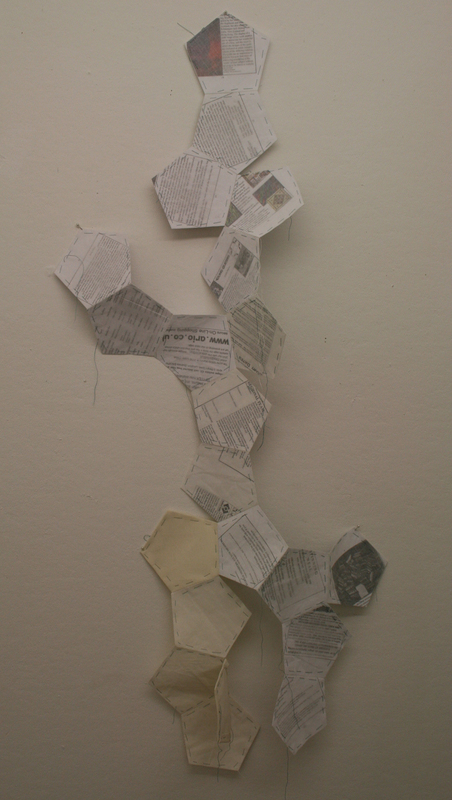 The work has made me reconsider my initial ideas and now I am thinking how to develop this new work. I have envisaged these pieces for several months and thought that I knew how they would look, but these samples are not working as well as I imagined. 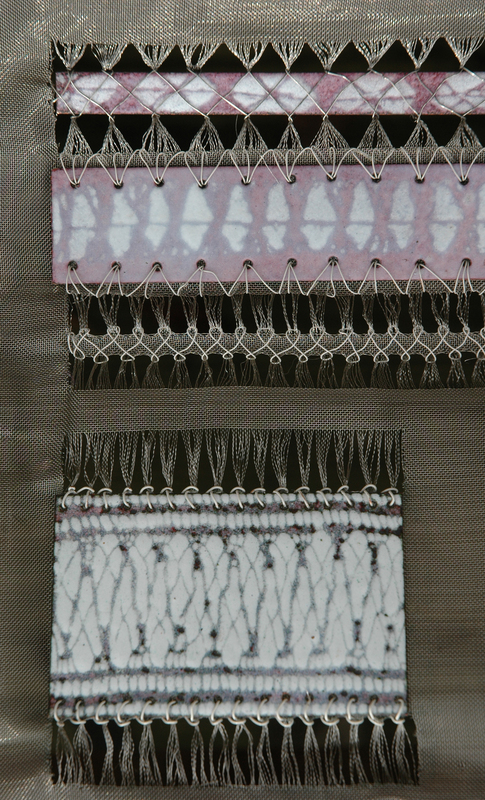 I am not sure if this is just a matter of scale, they are quite small – one is 15x60cms and the other 15x90cms, other enamel panels I have made using this stitched technique are much bigger and have more presence. So I probably need to leave them alone and view them in a few days/weeks time to gauge my reaction. But I did make several decisions that I am certain about. I decided to keep the stripes in different widths, as opposed to the same size blocks as in commercial colour charts, but I am not sure that I need so many stripes as more interesting effects may be gained by the gradation of the colours in one stripe – so the yellow sky stripe would be wider and go from rich coral pink through apricot to yellow to cream. 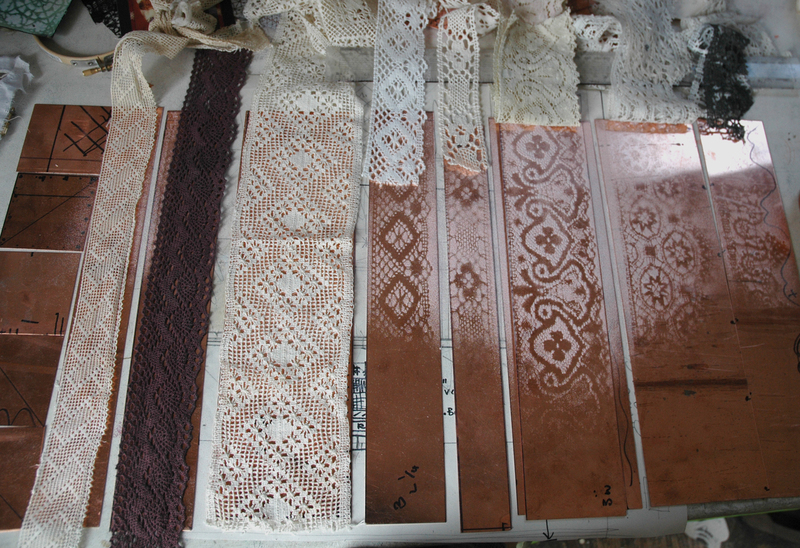 but I will loose the lovely slinky movement of the strips, I will need to sample further….. 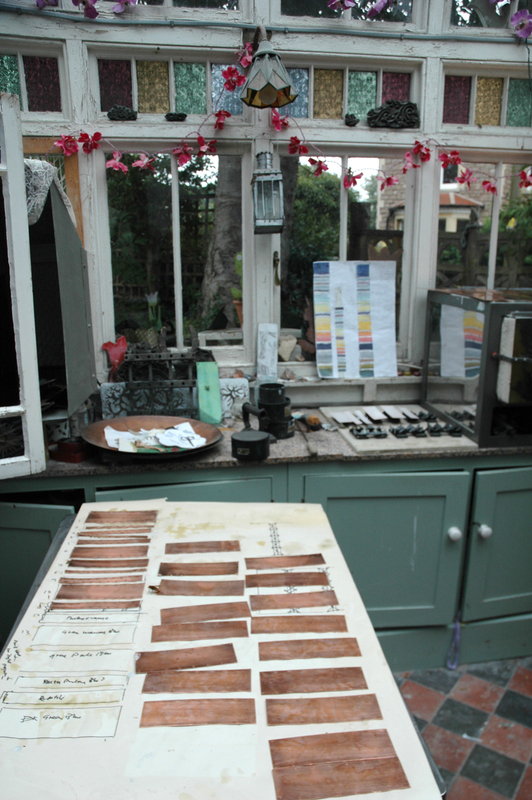 But these samples are successful in giving me the technical information I need:- an initial colour gamut to work from – I made the same size sample into a the colour reference with each recipe on the back. The glossy surface of the enamel has been chemically treated to make it matte, this also softens and distances the colours. 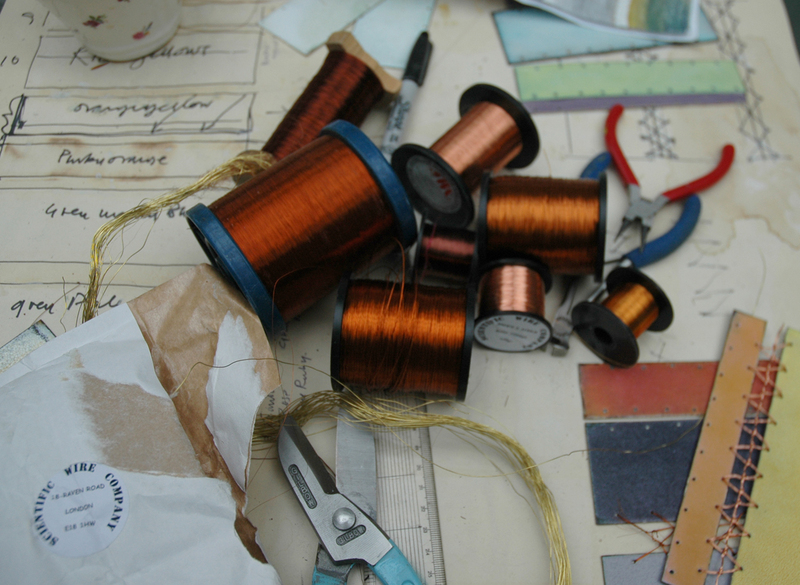 I decided that the actual stitching will be uniform throughout as in the sample on the left, and to use only copper coloured wires, from pale to dark, to unify the stitching; and I tested to find the best gauge of wire to use. So I ordered more wire from the Scientific Wire Company web site and it came in time for me to complete the work within my self imposed deadline of a week. 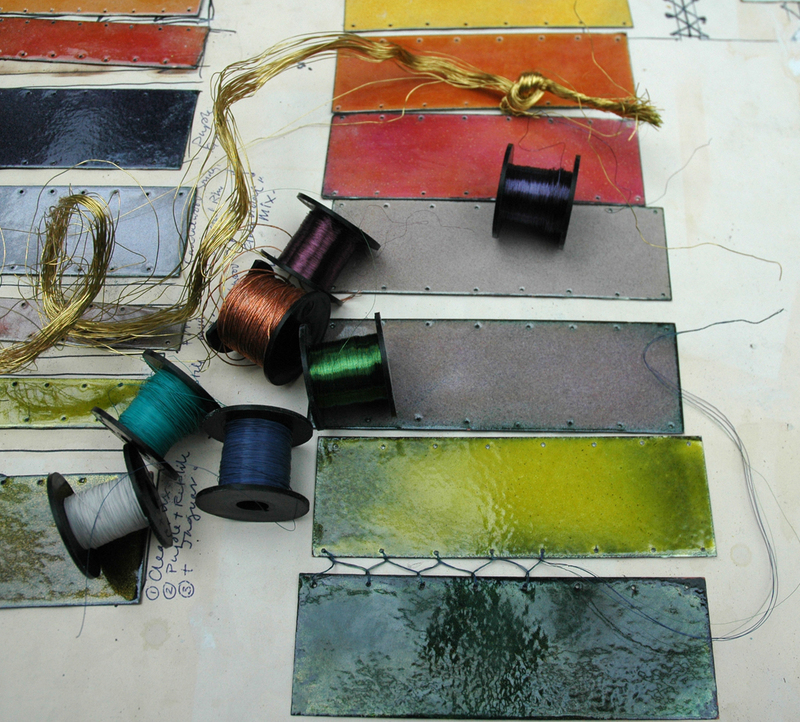 When stitching the pieces with the wire, I did consider whether I was actually stitching or threading – but why do I want to stitch this particular work – is it because I just want to make enamel fabric to this format again? 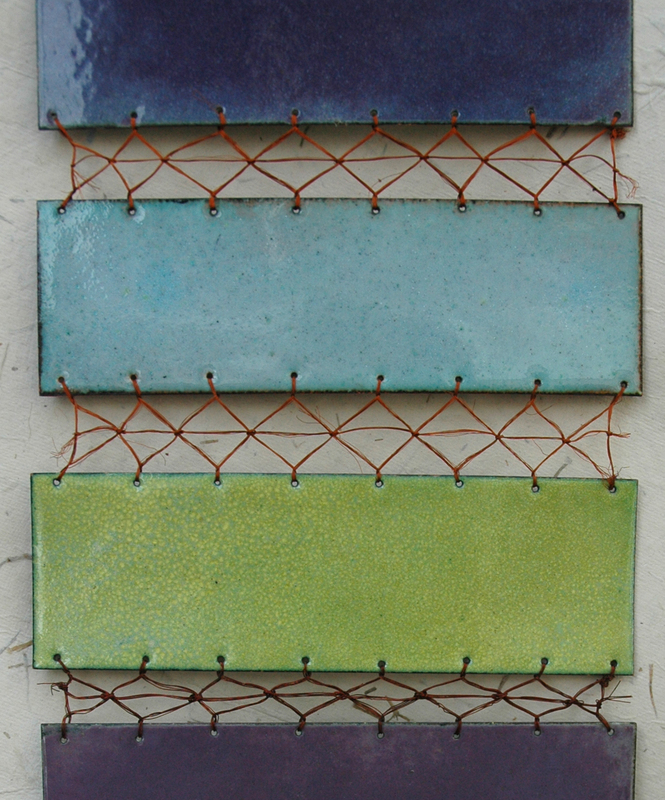 The original stitched strip enamel hangings can be seen in the Gallery section of the blog. 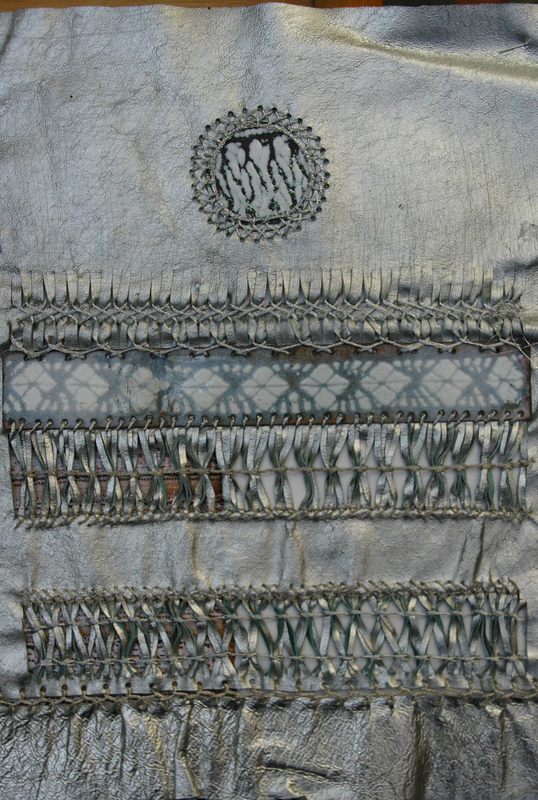 needle stitching patterns into wire interlacing. By chance I have just received a new paint chart, the idea that first made me see a way of using my original sky drawings, and I realised that what is so alluring here are those perfect rectangles of pristine colour, whether in paint, silk or woolen threads they give us a sense of order and are in fact complete entities in themselves. 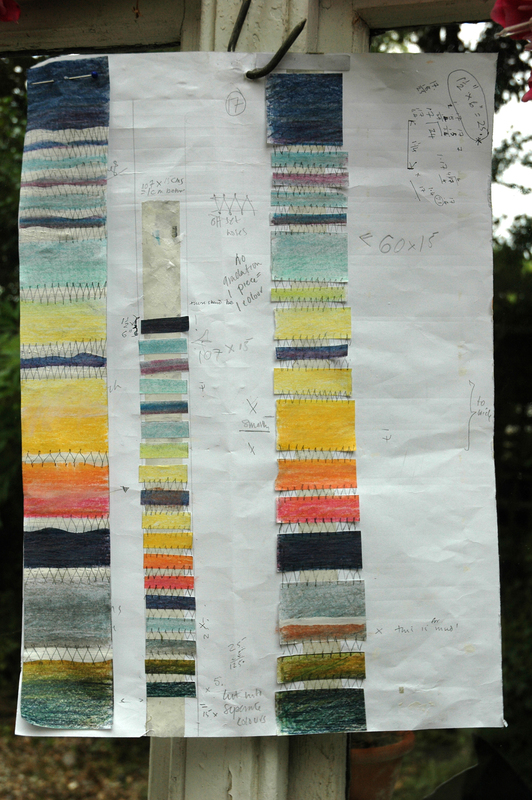 So how will my simple strips of colour give the impression of a whole sky and why do I want to do this? to contain it? to claim it? to make a version of it for myself, in a size I can manage? The sky is limitless, I am trying to convey the beauty of the colour in a tiny fragment -or does it need to be big – on the scale of a window? Maybe I should make a whole series of different striped skies and hang them side by side as in the chart layout? So here it is – the dilemma of making your own work from your own ideas – do you allow the work a life of its own and let it lead you where it will or do you stay faithful to your original idea and ignore all the possibilities that making affords you? At present the sky samples fall between these 2 options, which is why I am not sure how to continue just yet. And significantly it is being developed just as an idea, not a product as yet. I have heard writers talk of the characters in their novels who suddenly take on their own life and guide the story, is this what I need to let happen? Anyone got anything to say to me about this? 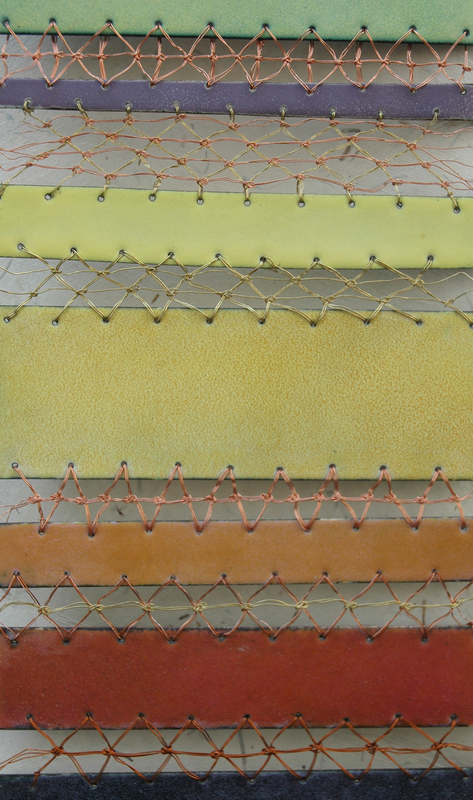 Categories: Stitched Enamel | Permalink. 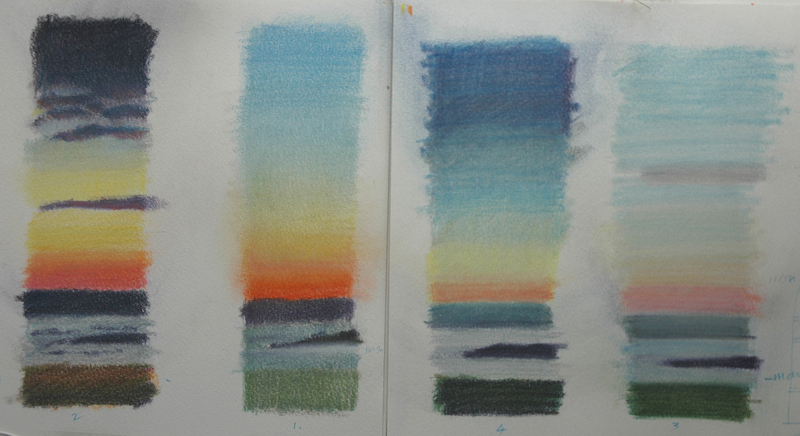 I had drawn up several colour studies for this work as I am not sure whether I want to have the stripes of the sky sized in relation to the drawings or seen simply as a colour chart – hence the 2 sets of samples opposite. 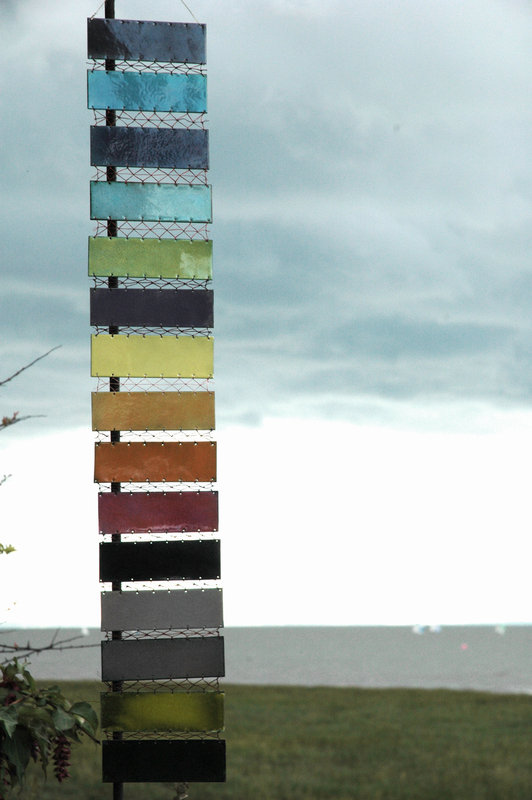 Each sample had been cut, drilled and cleaned in preparation for firing, now I had to make up the colour recipes from one of my sky studies shown in the previous blog, Severn Seas Skies. What I find fascinating about enamel and what drew me to want to make this work is that using several transparent colours over different ground colours it is possible to achieve subtle and glowing tones, perfect for describing the coloured air of the sky. The sky I chose to work from is the first sky on the left of the picture below, plenty of scope to run through a gamut of contrasting colours. 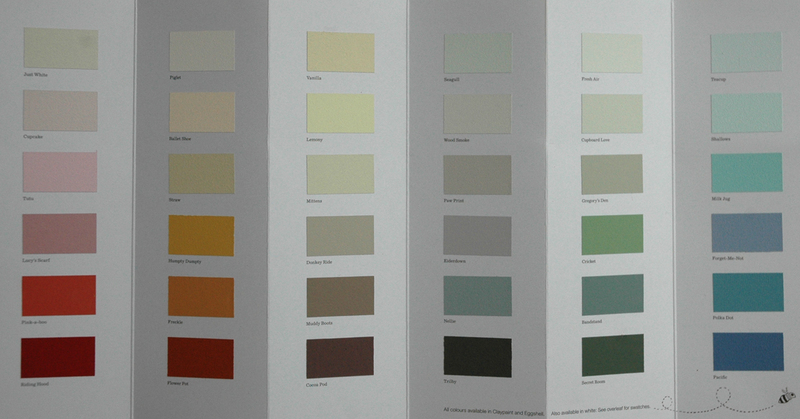 The actual colour chart that I worked from can be seen below, it is as close as I can make using my pastel crayons which can be blended into many subtle shades. 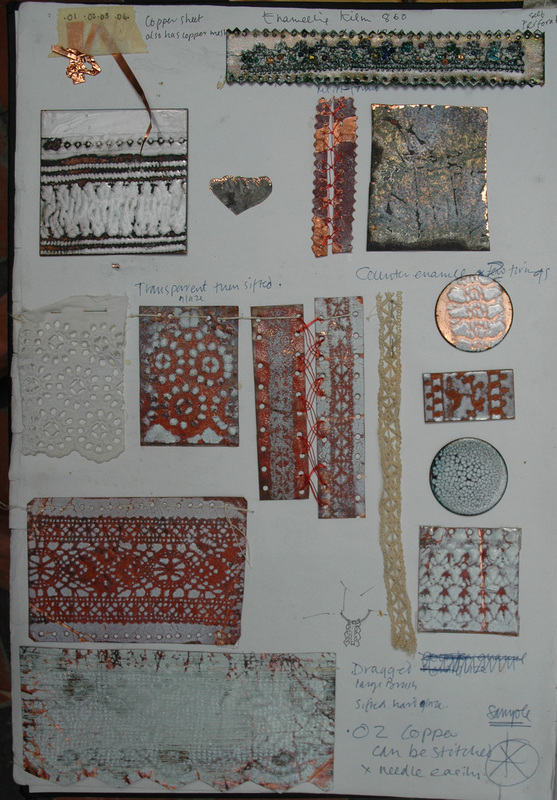 I will have to buy some more enamels later when I start the big pieces but meanwhile I work with what I have, this way I can discover some interesting outcomes and learn a lot. 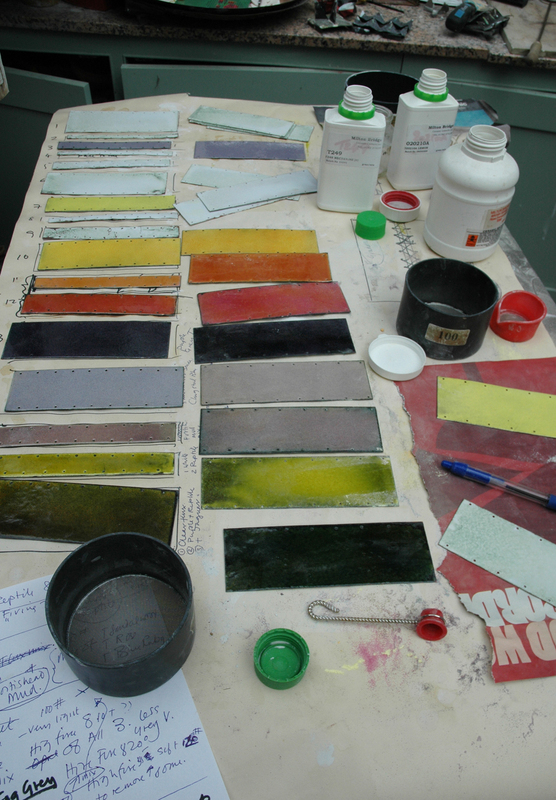 Making colour with enamel is not the same as using any paint I work with, I suspect it is like using glazes in tempera or certain types of oil paints, but I find it most like silk screen-printing which can be used for the over printing of transparent colours. 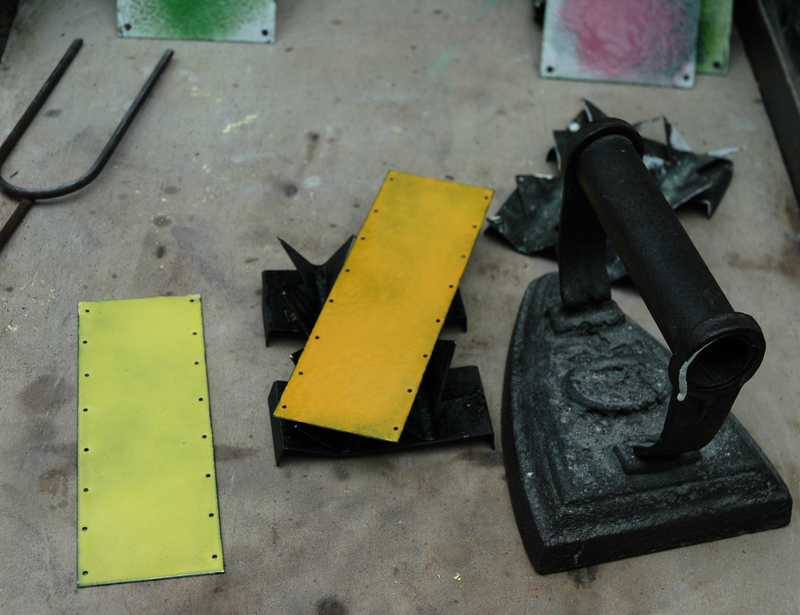 One of the things to get used to with enamel is imagining the colours before you have fired them, some pale colours are just white in powder form, and sometimes different batches of the same colour look totally different in the packages than the last batch you worked with – they always fire the well enough though. But it takes a long time to get used to all of this specially if you are a colour-control-freak. colour difference between cold and hot enamel, the old flat iron is to keep the plates from bowing when cooling, I found this one after a long search round junk shops - like 'Wagon Wheels', it looked a lot smaller than I remembered. I try to write the colour recipes down as I develop them, the scribbled notes can be seen below showing the half way stage of the sampling session. 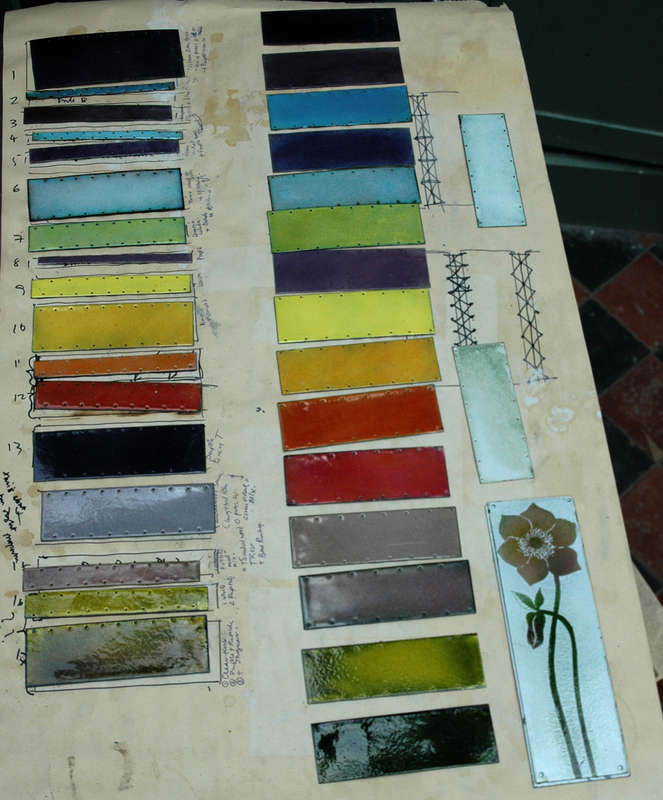 By the end of enamelling I have the 2 sets of samples and the recipes are sorted, but one unexpected and useful thing is that the 2 colours I made for the muddy water of the estuary are similar to a paint sample I was given for a commission to make a set of door plates, the hellebore doorplate is shown next to the colours below…..and most poetically, the enamels that make up this particular mud shade are called Sandlewood, Blue Ruby and Rose. 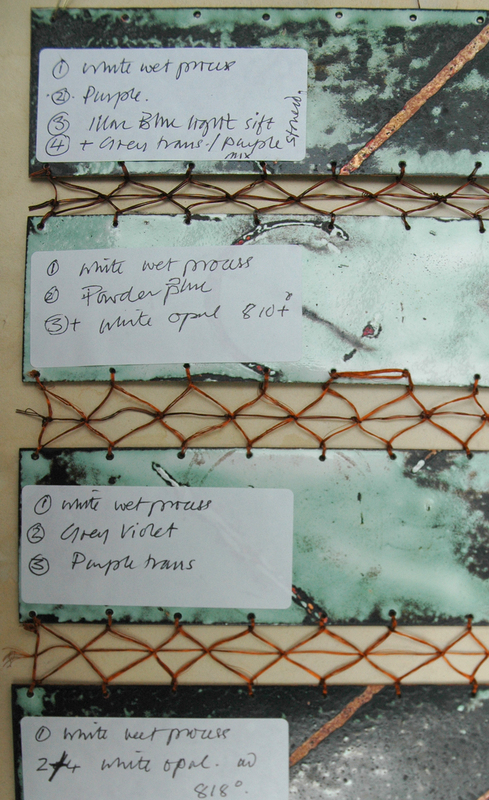 finished sample colours and hellebore door plate in tones of "Portishead Mud"
Now my next task is to decide the colour and thickness of the wires for stitching the plates together to form a panel; the first idea of muted blues and greens isn’t working…..and I feel I may need to get rid of the shine – I will keep you posted on my progress. 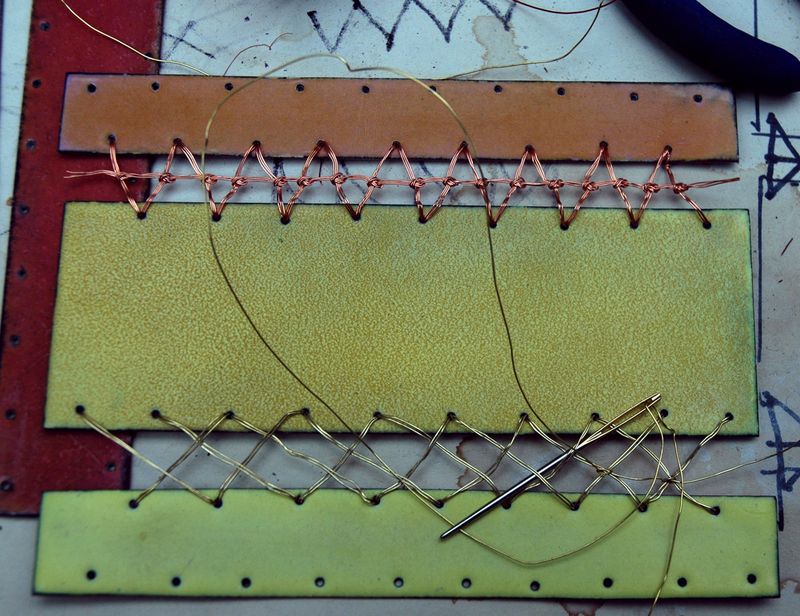 Sample stitching with coloured wires. 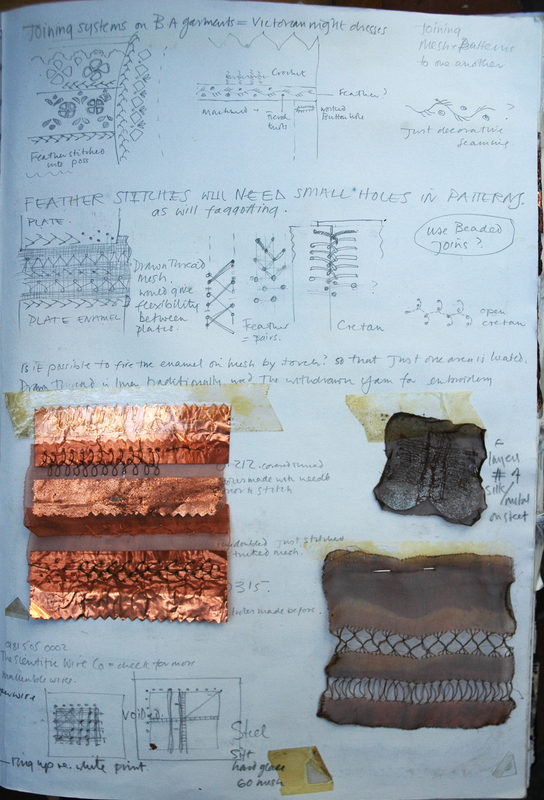 Categories: Drawing, Stitched Enamel | Permalink.